I have only just begun to realize the full power and versatility of this hand blender. I use it mostly to puree soups and blend smoothies. But it would be worth the price just for those two purposes alone. My favorite feature is the no-splash head. It prevents the food splatter issue that I've had with other immersion-style blenders. No more kitchen walls and clothing covered with Jackson Pollack-style food splatter art! The 400-watt motor is very powerful. This thing could turn concrete into dust. You can even use it to make juice from vegetables- and that's not something that you can even do with most full-sized blenders. In general, I am not a fan of accessories when it comes to kitchen appliances. I end up leaving all the pieces in my large kitchen drawers and rarely pulling them out. 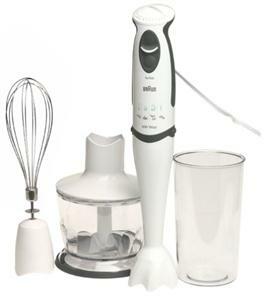 But this blender has some that I actually use, including a whisk, a tall blending beaker, and a chopping/dicing head. The processor attachment isn't great for large jobs. I actually like the Zen activity of chopping large amounts of veggies anyway. But it is fantastic for mincing small amount of garlic and onion for a quick saute. You can use it for salsa, too. Bottom line: I love this hand blender. I'm not sure what this little chopper can do that a large processor can't.